Fiber material DPV576 enhances recovery from mental and physical fatigue. Its effect and mechanism is discussed here in depth. The product was developed using patented fiber DPV576 P invented by Venex Co., Ltd.through business-academic-public initiative with Tokai University and the Government of Kanagawa Prefecture. Blood flow is improved by the action of the special material ingredients contained in DPV576. The product is recognized as having a remedial effect on fatigue by eliminating fatigue materials from the human body. Now, we approach the mechanism in depth! Our vital activity is controlled by autonomic nerves. Unconscious body functions, such as heartbeat, sweat activation, blood pressure, and gastrointestinal activity are ruled by autonomic nerves. 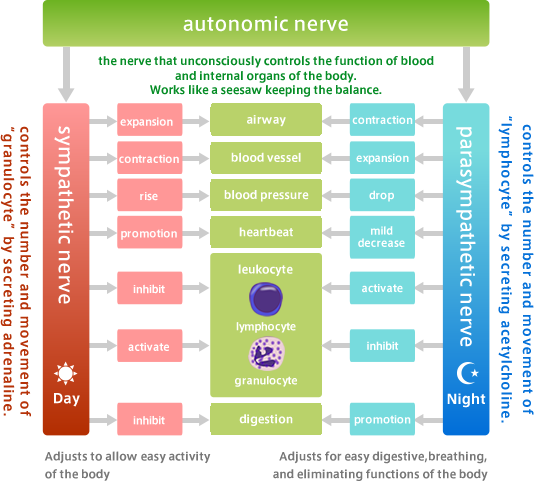 Autonomic nerves consist of two parts: the sympathetic nerve and the parasympathetic nerve. These two nerves work in opposition. Their relations are just like those of the accelerator and brakes of a car. When you are “excited” mentally and physically by the active use of brain or body, the sympathetic nerve works as an accelerator. On the other hand, when you are “relaxing”, such as being at ease or before going to sleep, the parasympathetic nerve becomes predominant and works as a brake. The sympathetic nerve and parasympathetic nerve are properly switching their roles even throughout the day. For a person in good health, sympathetic nerve activity increases as you become active in the daytime and parasympathetic nerve activity increases during the evening to night-time. However, because people today receive too much stress physically and mentally in the daytime, the number of people whose parasympathetic nerves do not function well in night-time is increasing rapidly. It is no exaggeration to say that the fatigue felt by people today is caused by irregularity of the parasympathetic nerve. Recent research shows that proper balance of the autonomic nerve leads to relief of fatigue and improved exercise performance. 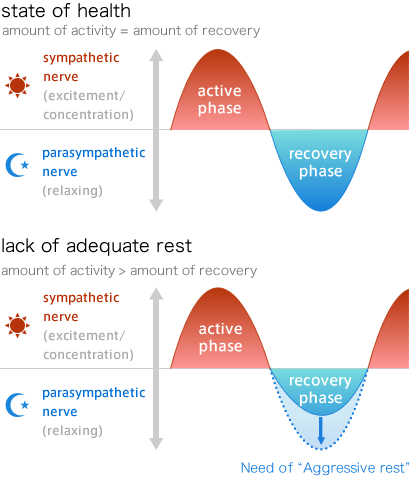 Without autonomic nerve balance when in a fatigued state (lack of adequate rest), the recovery phase can not be achieved fully and fatigue accumulates because the amount of activity surpasses the amount of recovery. This consequently causes chronic fatigue felt mentally and physically. Such chronic fatigue occurs when the function of the parasympathetic nerve remains low. Data obtained by measuring the function activity levels of the parasympathetic nerve, shows that parasympathetic nerve activity generally drops sharply when men turn from their twenties to thirties, and women from their thirties to forties. The rapid drop of parasympathetic nerve activity and the problems of chronic fatigue in middle and aged people are thus closely related. On the contrary, to recover from a rapid fatigue after sporting activities a rise of parasympathetic nerve activity is essential. For that, you need quality sleep that puts the sympathetic nerve in a switch off state. If you can enter deep sleep by activating the parasympathetic nerve, you can maintain the balance of the autonomic nerve and re-create or restore fatigued cells while asleep. what is needed to shift the autonomic nerve into a well balanced condition? What is needed is “Aggressive rest” that works upon the parasympathetic nerve in the short term is needed. Antioxidant component contained in fiber material DPV576 is deemed to have remedial effect on fatigue. The fiber uses low-molecular platinum which is also used in medical products. Having a minus electrical charge, this platinum has crisp and strong antioxidant effect and is used in various fields. It is found that fatigue owing to mental stress can be promptly relieved by the use of DPV576 fiber material. Mental arithmetic tests were conducted on 15 general adults, who were then divided into two groups: one wearing a product of DPV576 fiber material and the other group wearing a target product. Later, the saliva of each subject was measured for stress materials. 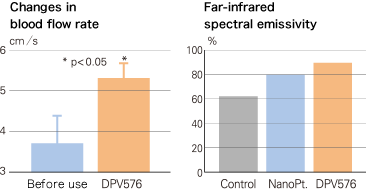 In the group wearing a product of DPV576, stress materials in the saliva decreased quickly in a short time. It was clear that stress was being reduced. Mechanism: blood flow increases and fatigue is remedied. Far-infrared radiation is activated by the use of DPV576 fiber material. This leads to the improvement of blood flow in the skin. Blood flow rates at the fingertips for five general adults were measured using Laser Doppler Blood-flow meter before and after the use of DPV576 fiber material. Measurements showed increases in blood flow. By measuring far-infrared spectral emissivity, DPV576 is confirmed to radiate far-infrared rays with higher efficiency than other fibers. Much more instant increase of parasympathetic nerve has been observed when wearing fiber material DVP576 than wearing other fiber material or wearing no DPV576. 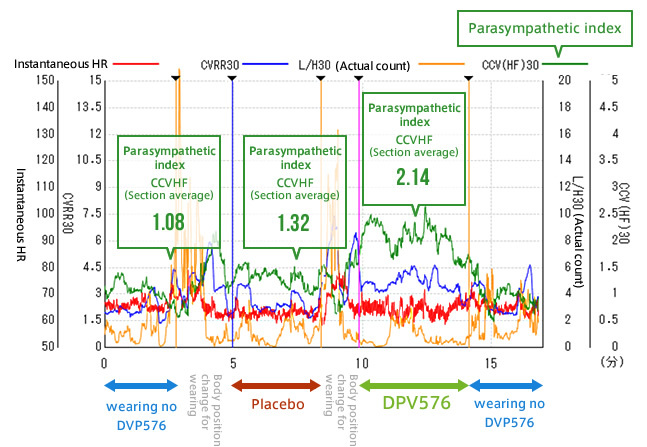 Changes of parasympathetic nerve were measured using heartbeat variability in three phases: when wearing DPV576 fiber, wearing other fiber, and wearing no DPV576. 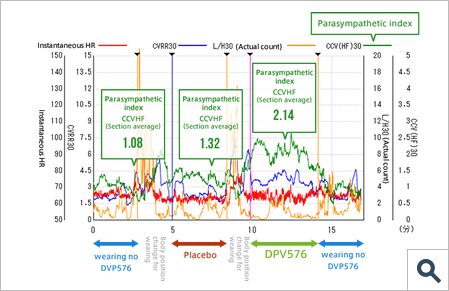 It was confirmed that parasympathetic nerve increases when wearing DVP576 fiber much more instantly than when wearing other fiber materials or wearing no DVP576. The use of DPV576 fiber material has been found to increase immune cells in leukocyte and lead to improved physical condition. A test was conducted for one month using mice whose immune competence had decreased due to aging. 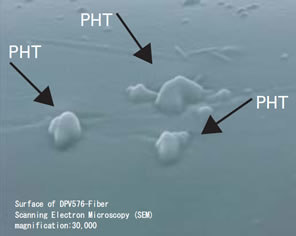 The mice were divided into two groups: one group using DVP576 and another group using target material. Among mice in the group using DPV576, immune competence activated as the same level as young mice and physical fatigues were remedied. 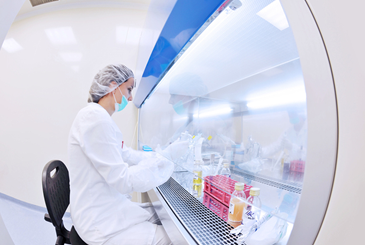 DPV576 has been confirmed safe as a result of pathological examination using mice. After injecting a liquid solution containing DPV576 to the abdominal cavity of mice for 30 consecutive days, the effects on their organs were examined. As a result of pathological examination of each organ, no changes have been found by comparing them with those of uninjected mice, and DPV576 has been confirmed safe. The World’s first “Not for exercise but for rest” wear was born, using nano technology fiber material DPV576 that stimulates the parasympathetic nerve. Various research results and the latest science and technology have proven that fiber material DPV576 has a remedial effect on fatigue. The developer of the fiber materials, Venex Co. has released the world’s first “not for exercise but for rest” recovery wear which promotes the human body’s innate capability of self-recovery. The material has been developed by a business-academy-public initiative with the Government of Kanagawa Prefecture and a university. PHT (Platinum Harmonized Technology) mingled in the Recovery Wear's textile helps your body’s naturally transformation into relaxation mode after exercise and promotes a situation where the body’s innate capability of self-recovery can be fully exhibited. 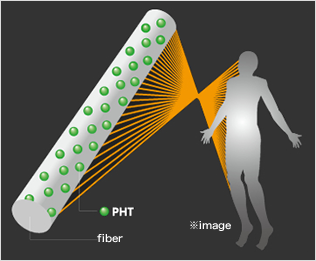 Wearing the fiber material prompts healing of muscle after exercise and this technology helps the human body exhibit its capability of self-recovery fully. For example, by wearing this material in non-exercise phases such as relax time or when going to bed, you can feel the lightness of your body as never felt before. What kind of effects have you experienced after the use? 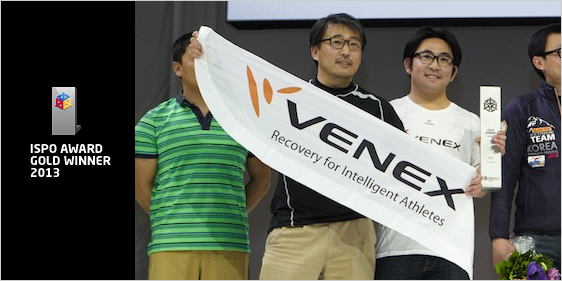 Venex Co., Ltd. has won Gold Winner for the first time as a Japanese company in Asian Products division of “ISPO”, the world largest sporting good exhibition! ISPO, International Sporting Products Exhibition, is the leading international sports business event held twice a year in Munich, Germany. During the event, new product contests are held which catch the attention of sporting goods buyers from around the world and are known as a springboard for sensational new products. The ISPO Award plays a role as proof of quality and as a barometer of trends in the sporting goods industries. Independent sports business professionals evaluate products by their functionality, innovability, design and select awardees through a comprehensive assessment. The best product award is presented to the winner in each of a total of six divisions, including five product divisions plus marketing division; and a GOLD award is given to products in sub-categories of each six divisions. For parasympathetic nerve activity which decreases with age, condition around the neck is the key. You can enhance the quality of your sleep by increasing parasympathetic nerve activity, improving blood flow, increasing immune competence and reducing deterioration of your body just by putting our Neck Warmer around your neck. The Mook book is a collection of the best of modern science, and comes with a special supplement “VENEX Neck Warmer”.. Please check the following official website of Venex for details of Venex Recovery Wear or to make inquiries. 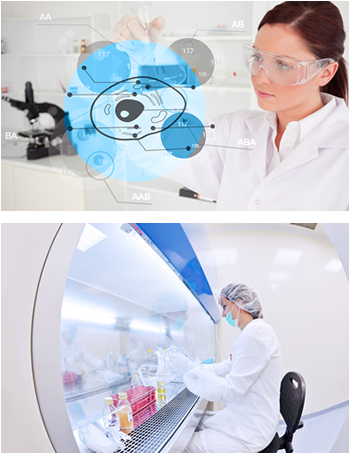 INFOM Advertising | Rrovision of Information：VENEX | © INFOM. All rights reserved. ©VENEX. All rights reserved.